Over the course of the last seven seasons of Game Of Thrones, Tyrion Lannister’s been a consistent fan favorite. He’s charming, witty, and criminally under-appreciated by his peers. He’s also, unfortunately, kind of worthless. As a new article from Matt Goldberg at Collider points out, the “game” aspect of Game Of Thrones has fundamentally changed since the conclusion of last season, which leaves Tyrion with, frankly, not much to do. As much as viewers enjoy having the quip-slinging, wine-drinking Lannister around, does the show even need him anymore? For the bulk of Game Of Thrones’ run, the show has been about political machinations and palace intrigue with the looming threat of magical ice armies hovering somewhere in the background. This was the time for Tyrion to shine. He could play the game about as good as anyone else, and watching him weasel his way in and out of powerful peoples’ confidence was a delight. That was before everyone in Westeros learned that a ceaseless hoard of ice zombies were headed their way. Palace intrigue seems kind of frivolous in the face of such a threat. Additionally, something happened to Tyrion in the aftermath of killing his father on a toilet. Since joining up with Daenerys, Tyrion hasn’t been very good at the one thing he’s supposed to be good at. Which is to say, he’s just not very smart. At the end of their curt reunion in the season eight premiere, Sansa tells Tyrion, “I used to think you were the cleverest man alive,” and the audience is left thinking, “Yeah, what happened with that?” Last season, his Westeros invasion strategy blew up in his face and this season he’s been somehow deluded into believing Cersei will help the northern cause, despite all evidence to the contrary. 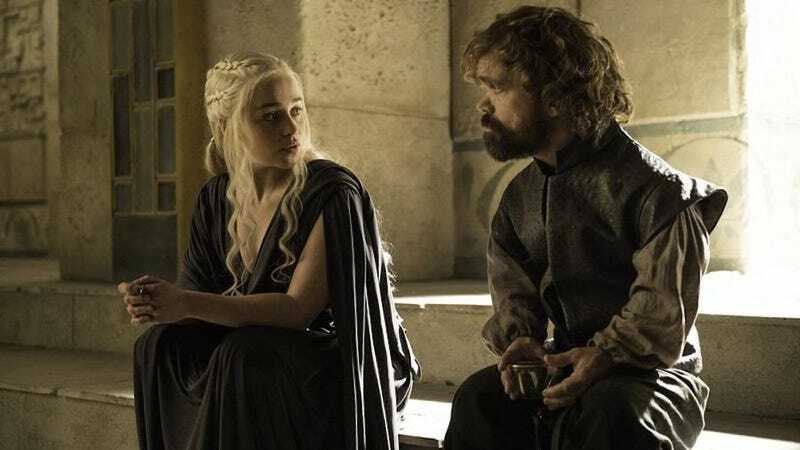 The best thing Tyrion managed to do recently was bring together Daenerys and Jon Snow, which doesn’t seem like it’s going to end all that well. Despite all this, Collider argues that there are two obvious reasons to keep Tyrion around. First, he’s still pretty charming and more Peter Dinklage will always make for a better TV show. Second, there’s undoubtedly going to be a final showdown within the Lannister sibling triumvirate, so Tyrion will have his role to play in that. Otherwise, it seems Tyrion will just kind of be hanging around, occasionally offering bad advice, and mocking Varys for his lack of testicles. It’s a somewhat disappointing end for a character who spawned so many great t-shirts, but, hey, Game Of Thrones has surprised us before. Peter Dinklage on Tyrion Lannister&apos;s fate: "Death can be a great way out"